Your garage door lubrication and inspection is just as important to your house as your roof or windows and is quite expensive to replace, but why is it very few households get it maintained? Many homeowners will carry out annual checks of their roof for loose or slipped tiles, missing and broken slates etc. However, when it comes to garage door maintenance too many people are missing it out altogether. This is extremely worrying given that the garage door can on many occasions offer another form of access to the home and a broken garage door can be a huge inconvenience to say the least. Garages also tend to contain tools, gardening equipment, bicycles and may other expensive items. In some cases, a broken or damaged garage door can also be potentially very dangerous (who likes a bang to the head?). There are however some simple checks that you can easily perform yourself or with a colleague to ensure the safe and efficient operation of your garage door and to help ensure maximum security. This is the most basic of maintenance tasks. It keeps the door running smoothly and stops the door creaking and squeaking. Apply a small amount of lithium-based spray lubricant to the door hinges, rollers, pivot points and the lock. Just doing this can extend the life of your garage door by many years. Instead of lubricating the track, it just needs cleaning with a damp cloth to remove dirt and debris and then spray a solvent like WD-40 on the track as it is a great grease cutter. Thoroughly clean the entire track being careful around entrapment points and watching out for sharp edges. It is also good practice to place some old newspaper etc on the floor to catch any dirt, debris or cleaning solution that may fall. Before you do anything, make sure that the garage door is closed and the automatic opener system (if fitted) is disconnected. Now lift the door manually- it should remain fully open and lift with ease. If it’s difficult to open, the door may be out of balance and should be serviced by a professional. Activate the door opener’s transmitter or push button and when the door hits the object it should automatically reverse. If it doesn’t reverse we recommend seeking help from a professional garage door specialist. If it doesn’t, close the door and clean the photo eyes with a dry, soft cloth do not use any harsh chemical cleaners as this may damage the photo cell beyond repair. Make sure the photo cell eyes are aligned accordingly. If in doubt seek help from a professional. Give the outside of the door a clean with a SOFT cloth/sponge or brush. Simply rinse with a bucket of water or a hose. If your door is made out of wood, examine the paintwork to see if it needs to be re-painted/stained or varnished. If you perform any of these checks and something appears to be wrong, we advise you to get it examined by a professional. Never stand or walk under a moving door, and never allow your kids to play with or use the garage door or opener controls. 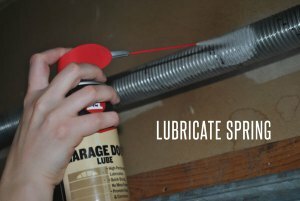 Still not sure about garage door lubrication? Call us today on 01384 231 211 or 07973 502814 for help and assistance on looking after your garage door.